The striking color of this bottle is very rare and has a distinctive translucency and pearl-like luster. See a bottle of almost identical shape and color, formerly in the J & J Collection, and sold in these rooms, 22 March 2007, lot 75. The same bottle is also illustrated by Moss, Graham, Tsang, The Art of the Chinese Snuff Bottle. The J & J Collection, no. 335, where no. 334 is of the same type of glass, but bears a mark identifying it as having been made for the use of the Qianlong Emperor himself, thus firmly identifying this particular color with the Imperial glassworks. Another bottle of this color, likewise attributed to the Beijing Palace Workshops, is illustrated by R. Kleiner, Chinese Snuff Bottles. The White Wings Collection, p. 72, no. 41. All of these bottles are thinly blown and have very similar footrims, and were presumably produced at the same time. 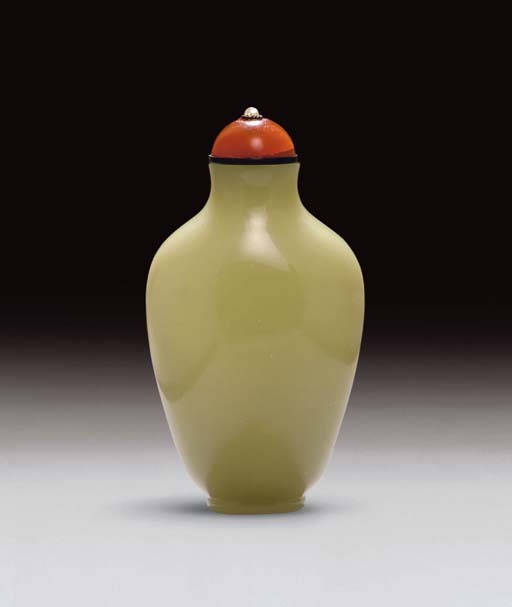 Otherwise, the distinctive color is extremely rare in Chinese glass.